Glass blocks have high thermal insulation values – superior to double-glazing and equal to double brick walls. Glass blocks act as a thermal barrier, significantly reducing heat loss in winter and heat gain in summer. 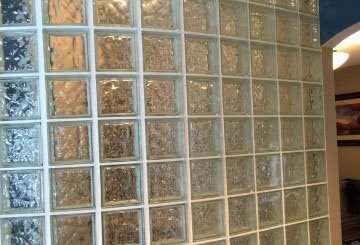 Glass blocks are typically used for window openings, showers, and wall panels, and are becoming increasingly popular with designers. Glass blocks are primarily chosen as a building material for their appearance, light diffusion, good fire ratings, impact resistance and thermal insulation. Glass block installation creates unique spaces by transmitting, refracting or reflecting light, providing privacy and security while allowing up to 80% warm radiant light transmission. A wide variety of colours, patterns and sizes are available in smooth or satin finishes. Satin finish blocks come with peel off protective plastic film for easy handling during installation. Our expert installers can provide design assistance and can create detailed drawings showing the correct positions for wall panel anchors, horizontal joint reinforcing, spacers and expansion material.